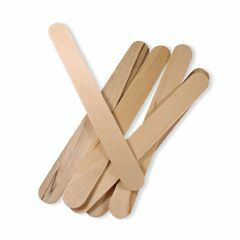 Wood Tongue Depressors are used to spread ointments and/or mix medications as well as for oral examinations. These hard wood products are clean and smooth and offer no odor or taste. They are exceptional for oral use, spreading ointments, mixing medications and even splints. I use these to identify plants, seedlings in gardening. They're inexpensive and work really well along with a permanent marking pen. We use this product to apply ointment to an open wound. Are these individually wrapped. I need them to be to treat burn wounds. If you get non-sterile, they are NOT individually wrapped. They come in a bundle.